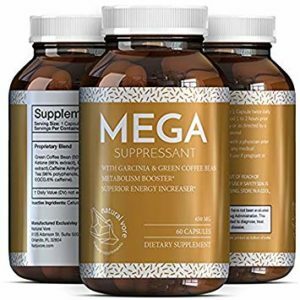 MEGA Suppressant is a dietary supplement for both men and women that has been designed to boost metabolism, increase energy and help with appetite suppression. It is nonprescription diet pill by Natural Vore. According to its Natural Vore product page on Amazon (an official Natural Vore website did not appear to exist when this review was written), this American-made weight loss pill claims that the ingredients within its formula provide increased metabolism to help burn more fat throughout the day so dieters can slim down faster. This entry was posted in Non-Prescription Diet Pills Reviews and tagged caffeine, garcinia cambogia, Green Coffee Bean, green tea, raspberry ketone on September 11, 2018 by Diet-Pills.cc. 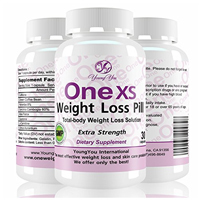 One XS Weight Loss Pill is an extra strength dietary supplement from YoungYou International. It is a “Total-body Weight Loss Solution” and supposedly all you require is 1 pill a day in the morning to help control appetite, increase energy, burn extra body fat and boost metabolism. This product is meant to be used in conjunction with a healthy diet and moderate exercise to achieve optimal results. Each serving (1 capsule) of the One XS Weight Loss Pill formula contains Caffeine (200 mg), Green Coffee Bean (175 mg), Garcinia Cambogia 60% (100 mg), Aloe Ferox (5 mg) Guarana (5 mg), L-Carnitine (5 mg). This entry was posted in Non-Prescription Diet Pills Reviews and tagged Aloe Ferox, caffeine, garcinia cambogia, Green Coffee Bean, guarana, L-Carnitine on August 14, 2017 by Diet-Pills.cc. 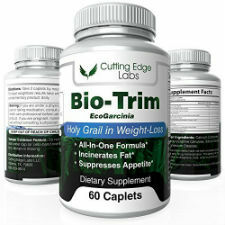 Bio-Trim EcoGarcinia is the “Holy Grail in Weight-Loss”, at least it is according to the bottle’s label. Produced by Cutting Edge Labs, this dietary supplement is an all-in-one formula that “incinerates fat” and “suppresses appetite”. This entry was posted in Non-Prescription Diet Pills Reviews and tagged acai berry, african mango, garcinia cambogia, Green Coffee Bean, green tea extract, HCA, Horny Goat Weed, raspberry ketone, Yakon Extract on January 23, 2017 by Diet-Pills.cc.